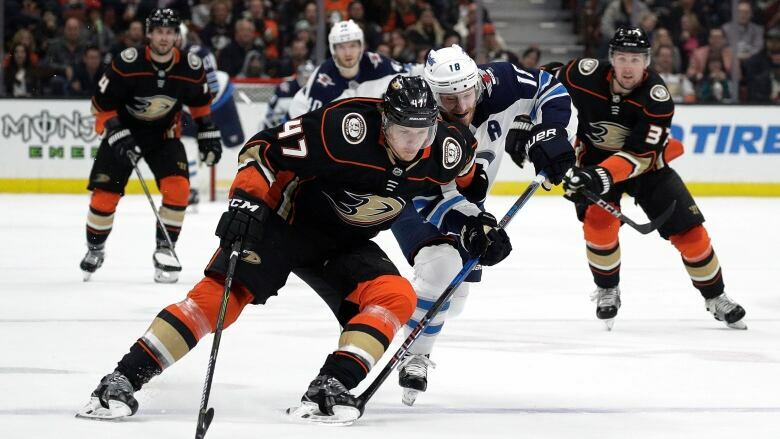 Adam Henrique scored a goal, added an assist and got the shootout winner as the Anaheim Ducks ended the Winnipeg Jets' three-game winning streak with a 4-3 victory Thursday night. Ducks goaltender John Gibson made 24 saves before he left the game with 6:40 left in the third period after Blake Wheeler lost an edge and hit into him. Ryan Miller didn't face a shot on goal in place of Gibson, but stopped all five Jets shooters in the shootout. Winnipeg's Connor Hellebuyck stopped 36 shots in the loss. Jack Roslovic scored his first career NHL goal to tie it at 3 in the third, and Patrick Laine and Brandon Tanev also had goals for the Jets. The Jets tied it at 3 when Roslovic fired a shot off a broken play around the Ducks' net at the 6:19 mark of the third. This came quickly after Kesler's goal at the 5:48 mark of the third put the Ducks ahead 3-2. Kesler fired a shot from a side angle to Hellebuyck that beat the netminder. Anaheim took a 2-1 lead 1:24 into the second period when Henrique's shot deflected off Ritchie and past Hellebuyck.